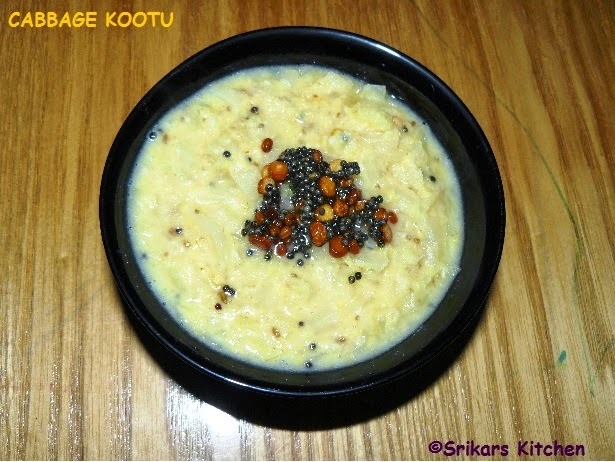 Cabbage kootu is one of the best kootu in southern part of india. This is very healthy dish . Adding moong dal is good source of protein.Moong dal and coconut is the main part of kootu. Take a pressure cooker or pan add chopped cabbage, moong dal, salt, water & allow to cook 1-2 whistle. Grind a course paste with coconut, cumin seed, g. chillies .Once the pressure comes down in cooker, add the course paste & mix well. Allow to cook in simmer & Heat oil in a pan, add mustard seed, channa dal & allow to temper and add to the kootu.If you like hing flavour, you can add in it.